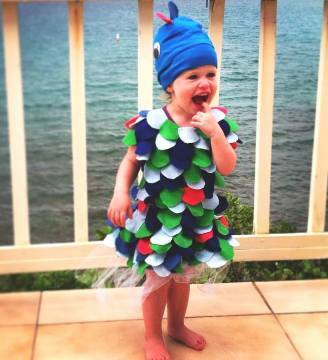 Traveling with a toddler is more of a horror story than a vacation in many people’s minds. How do you keep them busy on the plane? How many bags of toys and diapers will this require? What if the supermarkets don’t sell goldfish??!! I am here to tell you that it can be done and it can be enjoyable…for everyone. This was our second attempt at this and we learned some things since last year. Read on young parents and know that you do not have to put your vacationing dreams on hold one minute longer. The villa. 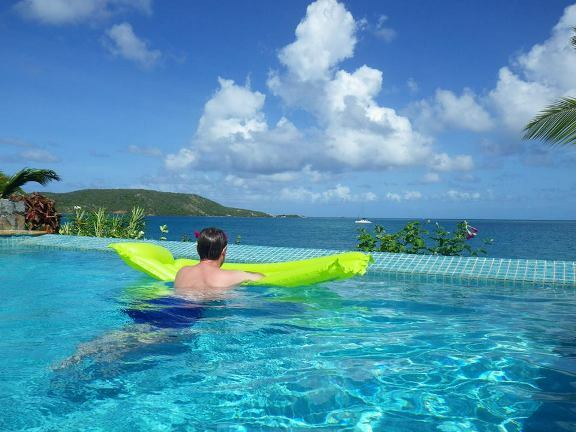 I do not see any way that we could pull off an awesome Virgin Gorda vacation without a villa. At 2 years old, our daughter sleeps peacefully from 7pm to 7am. Sounds great right? What doesn’t work for me is the image of me and my husband trapped in a 400 square foot hotel room watching the tv on mute, drinking warm beer at 7pm on vacation. Now picture our life in the villa, 7pm and Hazel is tucked into bed (in her own private room) with the sound of palm trees swaying outside her window. We have the whole night ahead of us; throw some fish on the grill, drinks on the dock, a moonlit swim in the pool? Yes, this was all possible in our very comfortable villa, VG SER, which was right on the water with a beach and dock and pool and sublime views. Select a villa that is family friendly. We vacationed in a beautiful villa last year, very modern and chic. With slippery floors and pointy edges it was not ideal for our clumsy, stair obsessed 1 year old. This year we looked for something more casual and all on one floor and we ended up very pleased. We chose to stay in Leverick Bay which is up and over the mountain from town. It has a nice neighborhood feel and is close to a Marina with restaurants, stores and a good food market. What I found most appealing about this area is that it begs for you to adventure out on the water. In the mornings we would watch the caravans of chartered sailboats leave the marina for their next destination. In the late afternoon the new crowd would come sailing in. Day and night, small ferry boats would be zipping across the Sound carrying locals and visitors from one dock to another. Transportation by boat is a lifestyle in Virgin Gorda and "exploring the neighborhood” means bouncing from island to island. 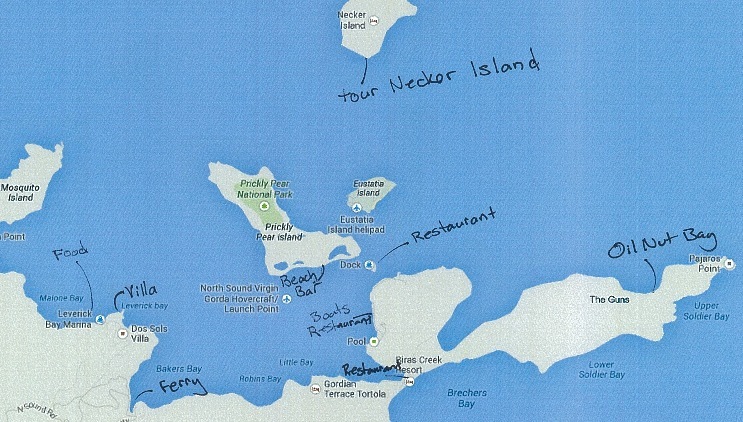 I’ve included a map with some notes on the places that are fun to visit from Leverick Bay. I had not been to Virgin Gorda in 20 years and last time it was by water, so I was looking forward to exploring the island. 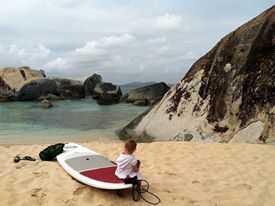 Virgin Gorda is most famous for the impressive seaside boulders that form The Baths. There are several beaches in that area and they are all just stunning. We visited twice on our trip, once to trek through the tunnels (as my daughter called them), spilling out onto picture perfect Devil’s Bay. On our final day we went to Spring Bay so I could do some exploring on the paddleboard. I paddled up past Little Trunk Bay and up to Valley Trunk Bay where I landed on the beach and swam from this completely secluded and gorgeous beach. 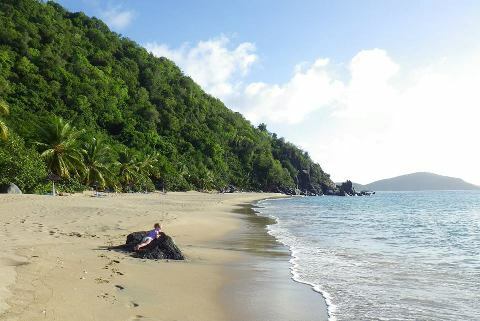 Other favorite beaches were Savannah Bay which had calm water and little shade huts on the beach, and Mountain Trunk Bay which was completely secluded and had a gorgeous reef for snorkeling. We were really impressed with the health of the reefs around Virgin Gorda, great for snorkeling. Let the kid nap. While vacation is relaxing for us, kids are used to (and crave) routine, so all the exploration can be stressful. We would make a point of being at the villa for naptime so she could go down in her crib for 2 hours. On the 2 days that we didn’t make this happen, she woke up at 4am wanting to hang out…just saying. We never get through half the things we want to do on vacation and end up in a discussion on how vacations should be a minimum of 10 days. Here is what we did get to do though. My #1 wish was to have a paddleboard so I rented one for the week and had it at the villa and would strap it to the car when we were traveling to beaches. Ryan wanted to sail so we spent a half day at Bitter End Yacht Club where he was able to rent a Hobie Cat for an hour. 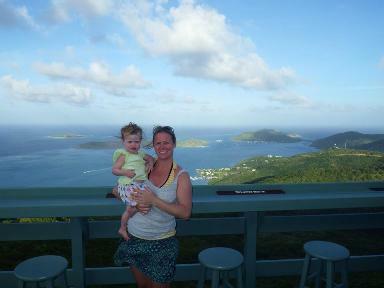 The most surprising part of our trip was touring Necker Island, owned by Richard Branson. This is a brand new tour that is only available through Gumption and his glass bottom boat. Branson supported Gumption, a Virgin Gorda local and avid kite surfer, in the creation of a glass bottom boat tour company that has exclusive access to lead 2 hour tours of Necker Island. Our tour started with a pick up right at Leverick Bay Marina and a 30 minute boat ride to Necker Island. Our tour was a walking tour to see the wildlife that Branson has brought to the island. First stop was the flamingo pond where the pink birds teetered and splashed and were the backdrop for a beach used for Necker beach parties. As we walked we would pass giant tortoises that sit like rocks in the shade gently munching on grass. It was a great thrill for me to go over and pet the tortoise and see them up close. Then it was on to the lemurs of which they have several breeds. Hazel tried to feed them a leaf and her fingers…luckily they were not interested. I had never met a lemur before and they are very friendly, agile animals. Last stop was a visit to the kite-surfing shed which was covered floor to ceiling with equipment including some cool boards with Virgin graphics. Back on the boat, we cruised over to Oil Nut Bay where Gumption was determined to find a turtle for Hazel. Turtles we saw, as well as a sting ray and cannons from a ship wreck. This is a limited edition tour and may not be around forever, so if you have the chance, take it. The rest of our trip was full of lazy days around the pool and floating on rafts from our beach. We had the pleasure of the company of several pelicans who would circle our villa and dive into the water for their catch. This never got old, very cool birds. We ventured into Spanish Town a few times for lunch and dinner and to stock up on groceries. We also attended a Halloween party that was put on by a local childcare company and was a nice way to celebrate and meet some locals. I wouldn’t say that Virgin Gorda is an island focused on cuisine, but we enjoyed some local flavors and seaside dining spots. Dining out is tricky business with an antsy 2 year old who isn’t all that interested in food. We look for beachside restaurants where she can run and play while we eat. Also, dining out is mostly restricted to lunch because by dinner, crankiness sets in as bedtime looms. We prefer cooking dinner in at our leisure. Also we would pack snacks when we would leave the house so she could eat even when we were on a remote beach. Overall it was another incredible beach vacation. My husband declared it “best vacation ever” and how could I argue. Perfect weather, endless natural beauty, really lovely people and a villa that Hazel was calling “home” by the end of the week.